Importance of religion and GDP per capita in the world. Religion is negatively correlated with wealth. 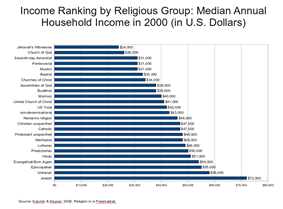 A chart illustrating income by religious group in the U.S. in 2001. There has been some research on the correlation of wealth and religion. Wealth is the status of being the beneficiary or proprietor of a large accumulation of capital and economic power. Religion is a cultural system that often involves belief in supernatural forces and may intend to provide a moral system or a meaning of life. A study in the United States, published in the Social Forces journal and conducted by Sociology researcher Lisa A. Keister, found that adherents of Judaism and Episcopalianism attained the most wealth, believers of Catholicism and mainline Protestants were in the middle, while conservative Protestants accumulated the least wealth, while in general people who attend religious services achieved more wealth than those who do not (taking into account variations of education and other factors). The researcher suggests that wealth accumulation is shaped by family processes. In the United States, 48% of Hindus have a household income of $100,000 or more, and 70% make at least $75,000, which is the highest among all religions in United States. The median net worth of people believing in Judaism is calculated at 150,890 USD, while the median net worth of conservative Protestants (including Baptists, Jehovah's Witnesses, Seventh-day Adventists, Christian Scientists) was found at 26,200 USD. The overall median in the dataset was 48,200 USD. Another study, published in the American Journal of Sociology (AJS) by Lisa Keister, found that "religion affects wealth indirectly through educational attainment, fertility, and female labor force participation" but also found some evidence of direct effects of religion on wealth attainment. 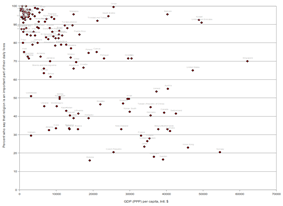 The GDP of countries generally correlates negatively with their religiosity, i.e. the wealthier a population is the less religious it is. Bill Gates is an agnostic. Carlos Slim Helú is a Maronite Christian. Lakshmi Mittal is a Hindu. Warren Buffett is an agnostic. Al-Waleed bin Talal is a Muslim. Mukesh Ambani is a Hindu. Amancio Ortega is a Catholic Christian. Bernard Arnault is a Catholic Christian. Karl Albrecht and Theo Albrecht are Catholic Christians. Mark Zuckerberg is a Jewish atheist. ^ a b "Religion Helps Shape Wealth Of Americans, Study Finds". Researchnews.osu.edu. Retrieved 2011-10-21. ^ "Religion and wealth: The role of religious affiliation and participation in early adult asset accumulation = Religion et richesse: le rôle de l'affiliation et de la participation religieuse dans l'accumulation de biens à l'entrée de la vie adulte". Cat.inist.fr. Retrieved 2011-10-21. ^ Survey Reports. "World Publics Welcome Global Trade — But Not Immigration | Pew Global Attitudes Project". Pewglobal.org. Retrieved 2011-10-21. ^ "Warren Buffett "Agnostic," Bill Gates Rejects Sermon On The Mount, Not "Huge Believer" In "Specific Elements" Of Christianity". American View. Retrieved 2012-05-20. ^ "Bill Gates". Nndb.com. Retrieved 2011-10-21. ^ "Carlos Slim Helu - Trade by Numbers®". Magazine.globeinvestor.com. Retrieved 2011-10-21. ^ "Billionaires Blog: BILLIONAIRE SUCCESS STORY : Lakshmi Mittal - Arcelor Mittal". Billionaires-blog.blogspot.com. 2007-11-24. Retrieved 2011-10-21. ^ "Warren Buffett". Nndb.com. Retrieved 2011-10-21. ^ "Wired 14.11: Faces of the New Atheism: The Scribe". Wired.com. 2009-01-04. Retrieved 2011-10-21. ^ "Mukesh Ambani". Nndb.com. Retrieved 2011-10-21. ^ "The Business of religion". Nndb.com. Retrieved 2011-10-21. ^ "Being Bernard Arnault". Nndb.com. Retrieved 2011-10-21. ^ Hall, Allan; Ledwith, Mario (2012-12-07). "Secretive Aldi family announce death of main heir to Â£11billion supermarket fortune... a month after he was buried". Daily Mail (London). ^ Boggan, Steve (2010-05-21). "The billionaire Facebook founder making a fortune from your secrets (though you probably don't know he's doing it)". Daily Mail (London).